These must-have accessories are useful for many outdoor activities. 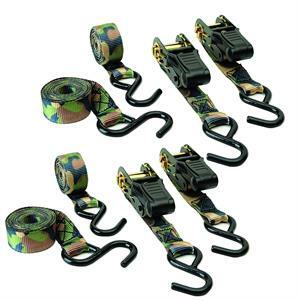 Use for tying down equipment or to update worn and weathered tree stand ratchet straps. They feature 1'' x 8' polyester straps with vinyl coated S hooks, spring loaded keepers, zinc plated ratchets and a working load of 500 lbs. Breaking strength of the straps are 1500 lbs.